In the Footsteps of the Poets - BBC Italy Unpacked. 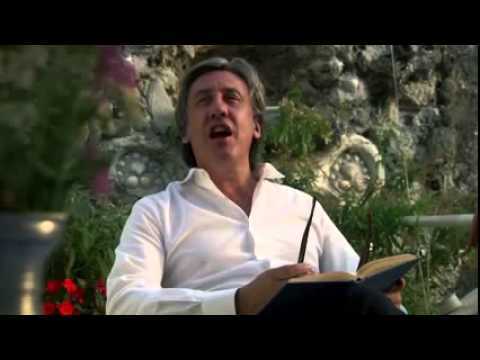 Beginning in Liguria, a region bordered by mountains and a beautiful rocky coastline which inspired the English Romantic poets, Andrew Graham-Dixon and Giorgio Locatelli travel along the west coast of Italy, exploring the culture and cuisine of the diverse regions. Their first stop is the city of Genoa, once a great maritime republic, whose former glory is reflected it its opulent Baroque palaces with their imposing facades, glamorous decor and splendid paintings by artists such as Van Dyck and Bernardo Strozzi. In contrast to these grand statements of wealth, Giorgio makes the simple dish that the city is famous for - pesto alla genovese. The two travellers' then move on to the Cinque Terre, a rugged portion of coastline featuring a national park and five picturesque villages seemingly wedged into the cliff face beside sea. Finally, Andrew and Giorgio cross over into Tuscany and, managing to stay off the tourist trail, visit a hidden gem of Renaissance art in Pistoia and one of Pisa's best-kept secrets. They finish back by the sea at the port city of Livorno, where the fishermen's catch of the day dictates the menu. Sorrento Express, was founded by Julia and Alfonso Amitrano and it has grown from a small scale local distributor of GIOIA CAFFE back in 1996 , to a UK national supplier and importer of mozzarella ricotta , pasta, fresh sausage and many other tipical italian products .